Angel Donuts and Treats is a premier bakery in northwest Austin serving heavenly donuts, cake balls, coffee and so much more! Angel Donuts and Treats opened in 2012 and is located inside the Trails at 620. Since then, we have been serving both quality interpretations of classic pastries and daring new ventures into the uncharted territories of sweet treats. 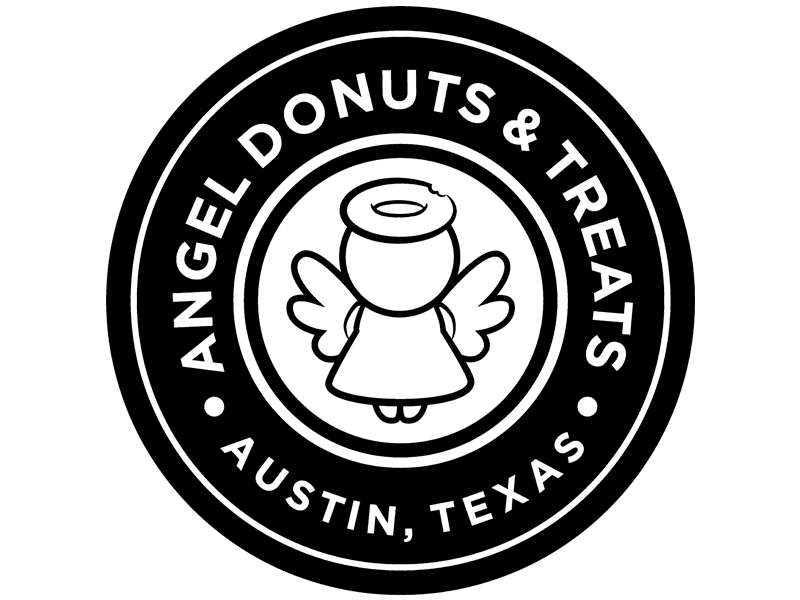 Angel Donuts and Treats interior is designed to reflect the hip sensibilities of the surrounding area while also paying tribute to Austin's storied past. Inside the bakery you will find a sprawling display of both savory and sweet treats. Serving everything from handcrafted donuts, delicious cake balls, refreshing bubble tea, gourmet macarons, hot and fresh breakfast tacos, buttery soft kolaches, french donut beignets, donut ice cream sandwiches, macaron ice cream sandwiches, fresh coffee and tea and handcrafted Italian sodas. Be sure to email or call ahead to place an order for donuts, kolaches, coffee travelers, cake balls or macarons. Also you're welcome to give us a call to check our inventory for the day; we may sell out of some items quickly! The quality of our food and the commitment to outstanding customer service is the goal here at Angel Donuts & Treats. $2.50 ea. / $25 doz. $.90 ea. / $8.00 doz. $1.00 ea. / $9.00 doz. a light and delicate blend of carrot cake covered in vanilla coating. not overwhelming sweet. best paired with a warm spiced tea or tea latte. a perfect combination of soft chocolate chip cookies and vanilla cake, covered in a luscious chocolate coating, and topped with crispy chocolate chip cookie crumbs. this one's for the cookie lovers! a chocolate lover's dream. a smooth and decadent chocolate blend covered in a chocolate shell. best paired with your favorite latte or go old school with a cup of milk! a delicious vanilla cake covered with our perfectly tempered milk chocolate. perfect for those with a heavy sweet tooth. a rich chocolate cake with the perfect hint of mint, and covered in milk chocolate. chocolate lovers unit! think along the lines of the famous Terry chocolate ball. delicious orange citrus hints mixed with luscious dark chocolate cake that's covered in milk chocolate. a delicious vanilla cake that is perfectly combined with a cookies and cream. it's covered in vanilla coating and topped with cookies and cream crumbs. pairs perfectly with milk. a delicate mix of chocolate cake, coconut, and pecans that's covered in milk chocolate and topped with soft coconut flakes. finish it with a mocha latte to fulfill any chocolate lover's dream! a delicious vanilla cake covered with our perfectly tempered milk chocolate. perfect for those with a heavy sweet tooth. completely gluten-free! the very first angel cake ball ever made in our kitchen! our "staple" if you will. a decadent vanilla cake covered in our vanilla coating that will definitely keep you coming back for more! completely gluten-free! a perfect blend of buttermilk, coconut flakes, and walnuts that's covered in vanilla coating. light, fluffy, and not overly sweet. pairs well with your favorite cup of coffee. a zesty mix of lemon and vanilla cake that's covered in vanilla coating. sweet with the perfect amount of sour notes. this mix of cream cheese and luscious red velvet cake is covered in vanilla coating. extremely smooth, rich, and paired very well with your favorite latte! this childhood staple for most of us is formed into a delicious angel cake ball! this mix of chocolate cake, graham crackers, and marshmallows is covered in our milk chocolate coating and topped with graham crackers. a perfect combination of strawberry and cream cheese flavors that's covered in our delicious vanilla coating. paired well with a cup of green tea or green tea latte. the very first angel cake ball ever made in our kitchen! our "staple" if you will. a decadent vanilla cake covered in our vanilla coating that will definitely keep you coming back for more! nothing beats a plain cake donut with your morning coffee. notice a tiny spice note. it’s like eating a fried brownie. fried brownie dipped in chocolate icing. our very own chocolate icing topped on a plain cake donut. the original plain cake is rolled in a delicious mix of cinnamon sugar. blueberry cake with blueberry morsels. crispy on the outside, smooth on the inside. a donut that’s crunchy on the outside and moist on the inside covered in sweet glaze. nothing more than the old-fashioned donut dipped in our chocolate icing. an old-fashioned donut that’s dipped in the smoothest caramel and topped with fine Italian sea salt. powdered sugar, chocolate iced and cinnamon sugar. Be sure to call ahead to insure availability. Can be ordered by the dozen 24 hours in advance. yeast raised and handcut "Happy Birthday" letters. Mix of icings and toppings for $15. Additional $1 per donut letter. New Year's custom donuts, It's a Boy custom donuts, It's a Girl custom donuts, holiday, gradution and gender reveal custom donuts. crispy on the outside, fluffy on the inside with the perfect amount of sweetness. a delicious donut dipped in our very own chocolate icing. birthday cake-like vanilla icing on an crispy donut. happy birthday mr. or ms. awesome! strawberry lovers unite. a delicious donut topped with a strawberry icing. our very own maple icing that’s smooth and won’t overpower your donut. same as our chocolate iced, but then dipped in some super awesome sprinkles. same as our chocolate iced, but then dipped in roasted chopped peanuts. same as our chocolate iced, but then dipped in some moist coconut flakes. yes, you read it right. our “bacon master” first starts off by candying the highest quality bacon every morning. the original glazed donut is dipped in our delicious maple icing and then topped with the delicious candy meat - BACON! as odd as it may sound, our bakers make sure you get a wonderful balance of flavors in every bite. well worth a try...at least once!